Leroy Tick and Silvia Kastel contribute field recordings to Daughter Of The Boot, a new release out now on Chocolate Monk. 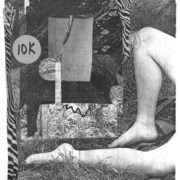 This collaboration by The Tenses + Bren’t Lewiis Ensemble features Oblivia and Ju Suk Reet Meate of Smegma, Lucian Tielens, Gnarlos, and The City Councilman. On a gorgeous spring afternoon in the PacNW, there is no better way to spend it than inside a 420-square-foot windowless room rattling sleigh bells with your foot, dropping rubber balls onto a broken old bongo drum, spinning scratchy records backward by hand, and sputtering into a shenai steadily and slowly so that it sounds like you’re pushing a desk across the floor. Here is sixty-five minutes of spontaneous sound collage, bent improv, non-musical weirdness that resembles injured mammals on the verge of giving up, surprisingly delicate noise, and general quasi-cinematic clatter. The two pieces delivered here by these clunkmeisters — recording together for the first time — are rusty, crusty, dusty and musty epics in the tradition of groups such as Morphogenesis, Solid Eye, Taj Mahal Travellers, and early Zoviet-France. Cover art by Ace Farren Ford. Numbered edition of 80.